A year ago I wrote a story about my favourite Colorado hometown cafe. It was called “A Mountain Gem for 70 Years”. 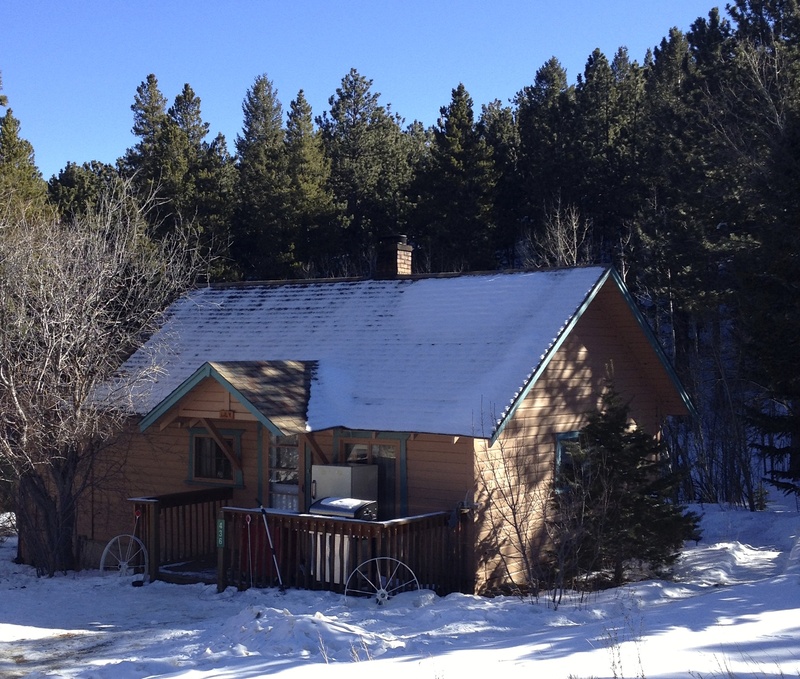 A Mountain Gem for 70 Years The owner, Rocky St. John, passed away right before Christmas. In tribute to her, I have revised my words with a few new photos. Over breakfast this morning, I spoke with her sons, Ben and Joe, who, along with their father, are keeping the cafe open in her memory. She trained them well. Allenspark, Colorado lies in a curvy bend off Highway 7, between Estes Park and the valley below. As you drive past the majestic scenery of Wild Basin and the backside of Long’s Peak, it’s easy to simply bypass this tiny town. But if you turn right onto the business spur, it’s probably because you know about Rocky’s Meadow Mountain Cafe. On a hillside halfway through town is a small green building with purple trim. Colorful buttons are mixed into the cement between the slate stone steps climbing to the front porch. 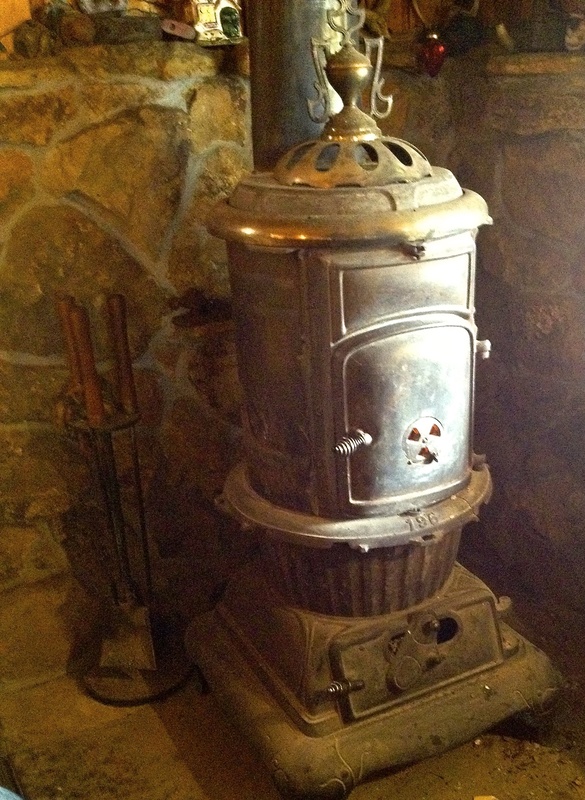 The main room has knotty pine walls and an antique potbelly stove, radiating warmth. 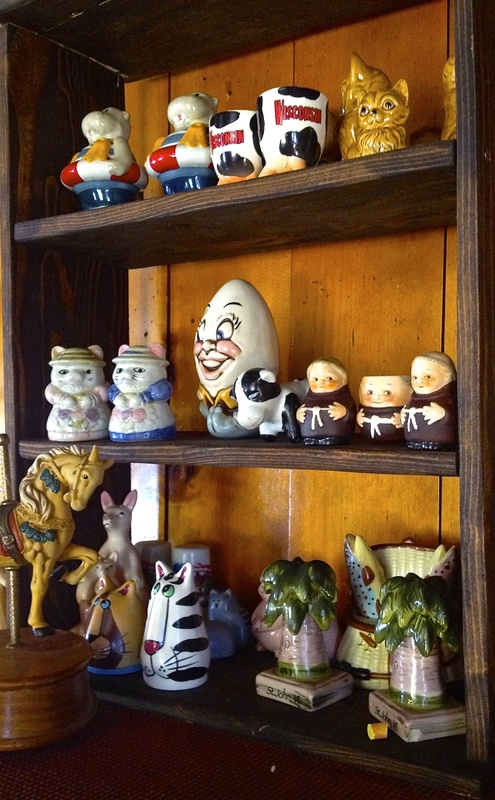 Shelves are lined with an eccentric collection of salt-and-pepper shakers. Local artwork is for sale on the wall. Behind this quaint façade is a long history of food, friendly service, and loyal customer relationships. It began in 1946 with a local character named Lil Lavicka. Known as the “Pie Lady”, Lil was famous for her homemade baked goods. As part of a divorce settlement, her husband hastily built a two-room cafe across from her tiny home. Lil’s Pie House flourished for twenty summer seasons. 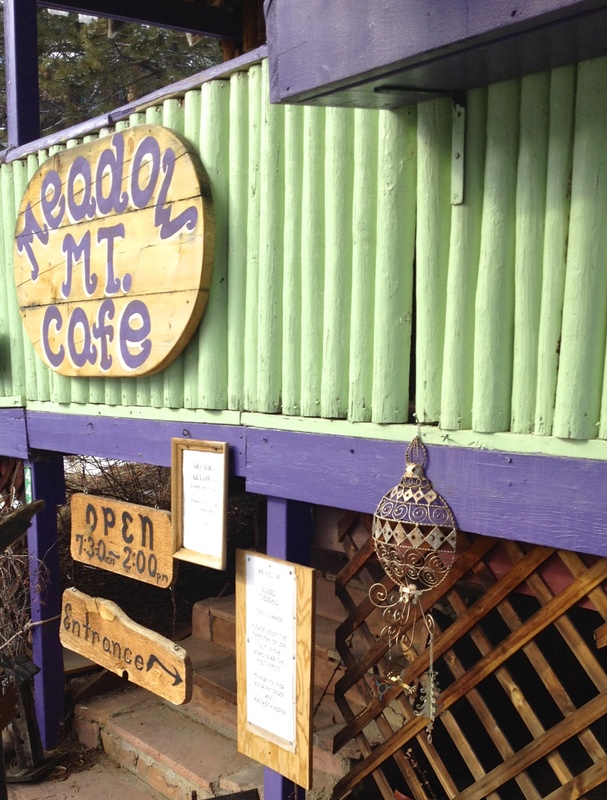 Then, after several changes of ownership, Meadow Mountain Cafe was born. Breakfast and lunch became the daily fare. Food was fresh and home-cooked to order. Coffee was hot–with a touch of cinnamon. Consistently good food, friendly service, and reasonable pricing enhanced its’ reputation beyond the boundaries of the small community. Locals and tourists lined up for a table inside or on the covered porch, complete with hummingbirds, flowers and an overhanging pine tree. Lil Lavicka’s seasonal pie house evolved into a legendary year-round cafe with returning customers, who became friends. 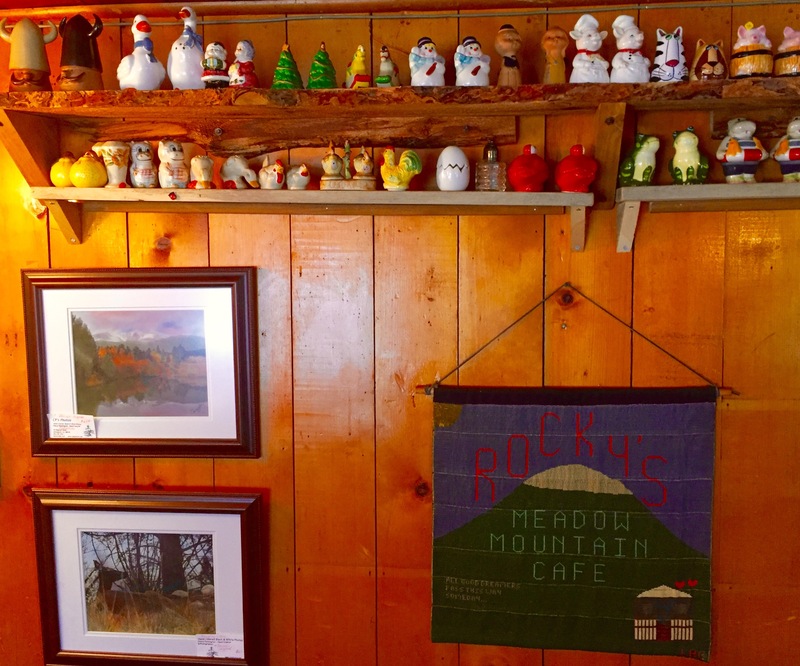 Roxanne [Rocky] St. John began waiting tables at Meadow Mountain more than 30 years ago. It wasn’t long before her cooking finesse and creativity nudged her into the kitchen full time. Rocky worked the grill for several female owners until finally, in 2007, she took over solo ownership. Already an established part of the ongoing success of Meadow Mountain, it was time to put her personal stamp on the place. 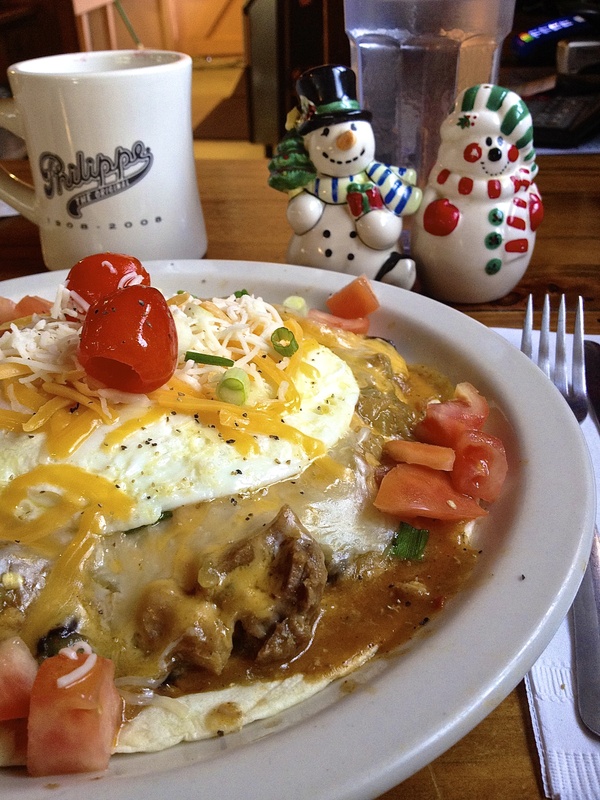 Rocky introduced two new house specialties–the veggie burger and the green chili sauce for huevos rancheros. Cinnamon spiked coffee is still standard, of course. She chose the outside paint colors and easy-on-the-eye peach walls for the kitchen. The button-inlaid steps were designed and built for safer access in all weather conditions. An herb garden was planted out in back. Inside, the eclectic collection of coffee mugs and salt-and-pepper shakers [always part of her style] continued to grow. Her kitchen blasting music-of-choice ran along the lines of Bob Dylan and Johnny Cash. 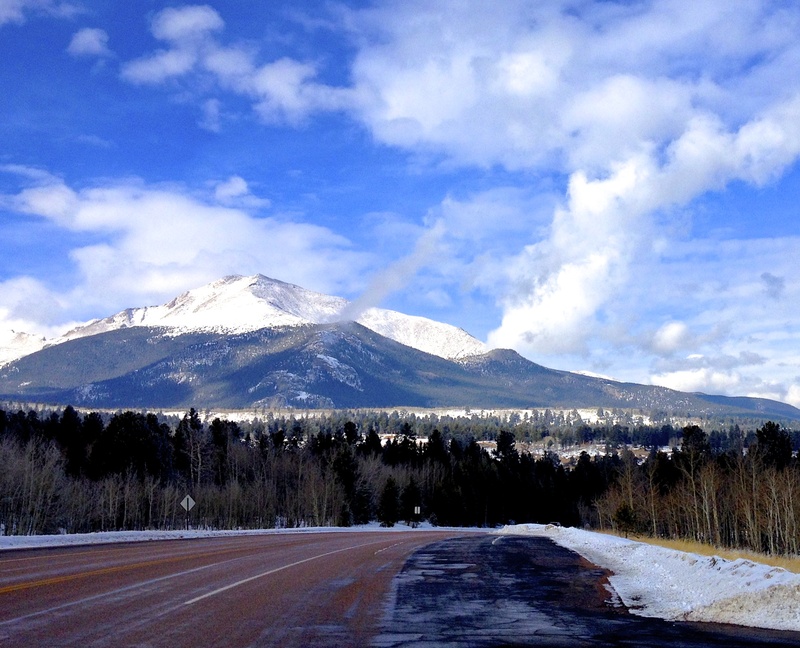 We have been driving from our cabin in Estes Park to Meadow Mountain Cafe for more than 15 years. It never disappoints. It’s not meant to be fast food. You wait patiently and sip good coffee, talk leisurely. Perhaps you warm your back near the antique stove, muse over the salt-and-pepper collection, read a book or eavesdrop quietly on another conversation. You watch regulars walk into the kitchen to say hello. At a corner table, friends sit and play cards after their meal. A man at the counter leans his chin into one hand and dozes, holding a coffee cup with the other. Orders parade out of the kitchen. Coffee mugs are refilled. Homemade brown bread, thickly sliced for toast or sandwiches, is baked twice daily in summer to keep up with demand. The scene is homey and multi-dimensional–from the diversity of customers stepping through the door to the din of country or rock-n-roll music pouring out of the kitchen. Conversation and laughter is spiced with the clatter of plates and silverware as tables empty and fill. What sustains this kind of success in a town of just over 500 people? Rocky, along with the women before her, crafted a timeless formula. It begins with an old-fashioned hard work ethic. It’s maintained by keeping quality high, service friendly, and community relationships strong. Rocky was passionate about what she did and consistently did it very well. And then, just maybe, that hint of cinnamon in the coffee didn’t hurt either. Allenspark, Colorado lies in a curvy bend off Highway 7, between Estes Park and the valley below. 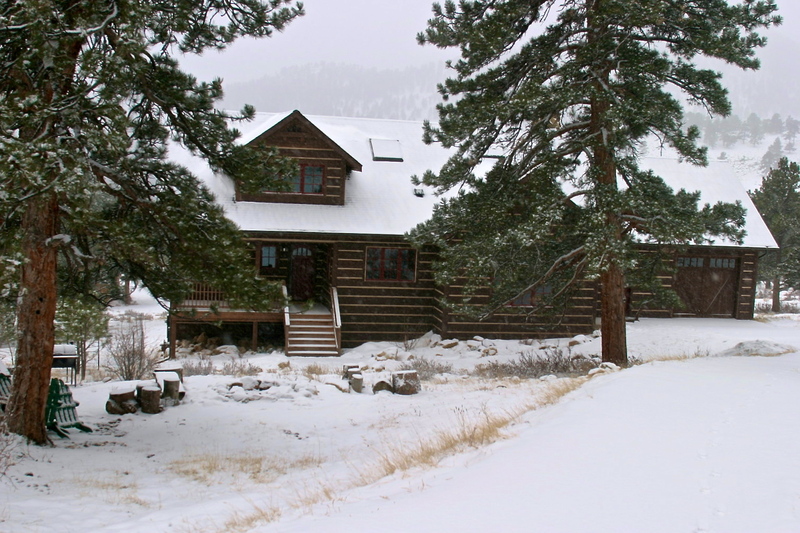 It is situated within the Roosevelt National Forest and surrounded by mountains of the Front Range Colorado Rockies. As you drive past the majestic scenery of Wild Basin and the backside of Long’s Peak, it would be easy to bypass the business spur and keep descending the mountain. 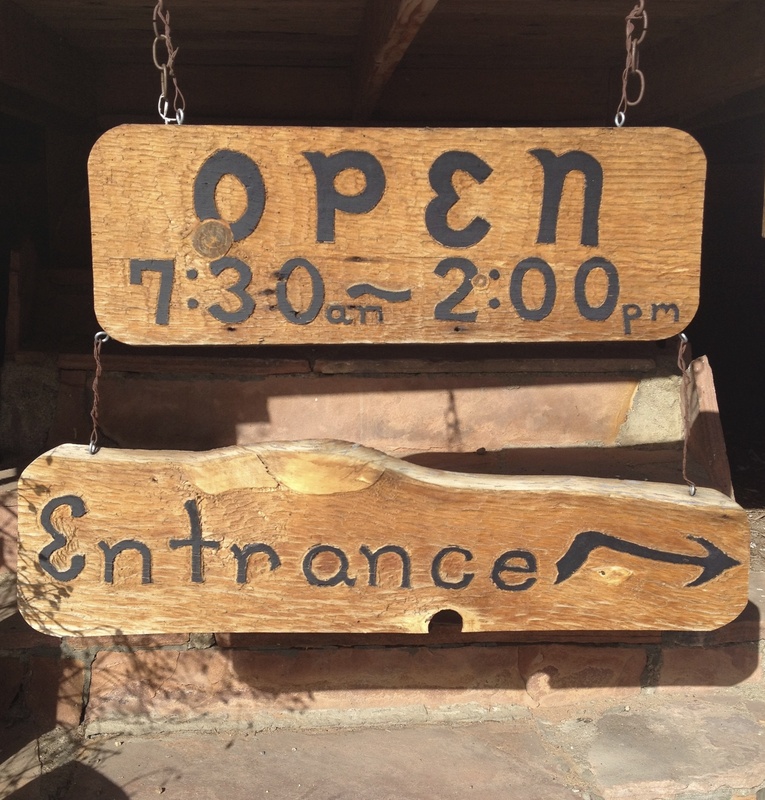 But if you do make the right hand turn into Allenspark, it’s probably because you know about an historic hillside landmark halfway through town–Meadow Mountain Café. On the outside, it is painted green with purple trim. There is always a line up of cars parked below. 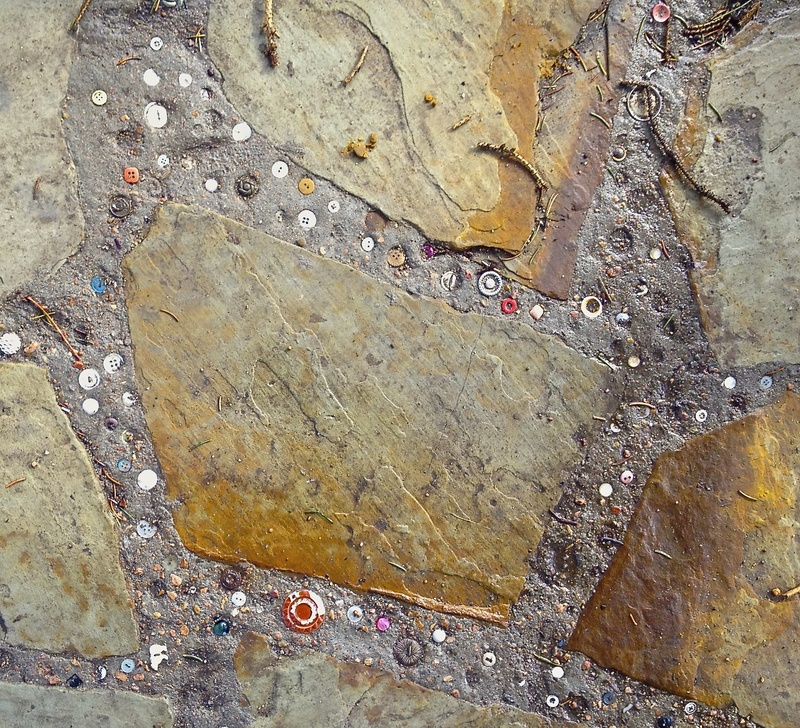 An assortment of buttons are mixed into the cement and stone steps that you climb to the front porch. Inside, the main room has original knotty pine walls and a working potbelly stove for heat. 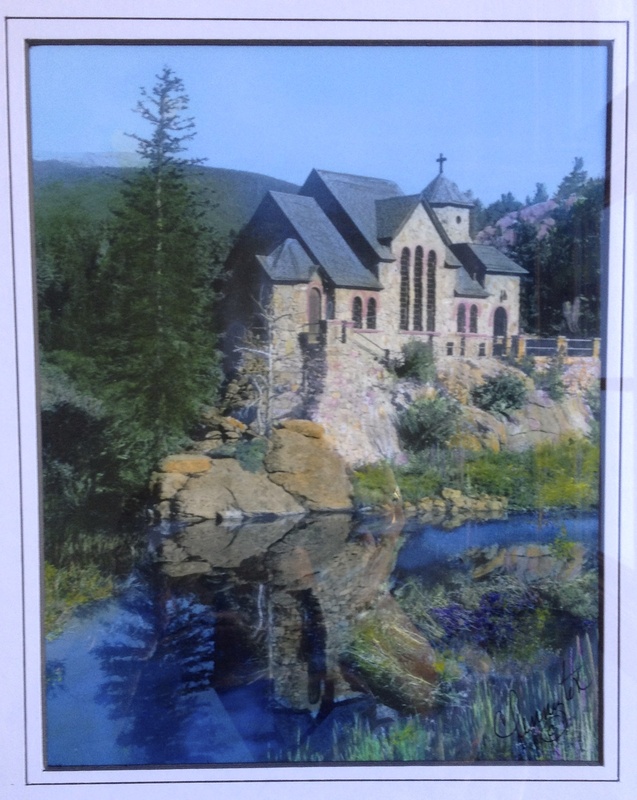 Hand colored photographs by a local artist are displayed for sale. 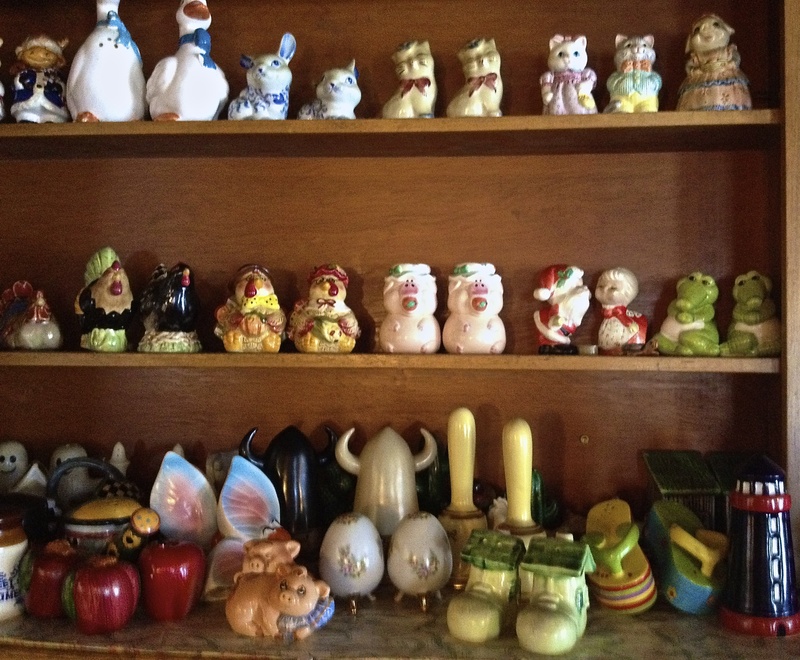 An eccentric collection of salt-and-pepper shakers line the walls. Behind this quirky façade, there is a long history of food and relationships that began in 1946, with a local character named Lil Lavicka. Lil was known as the “pie lady”. As part of a divorce settlement, her husband hastily built a small two-room café where she could sell her baked goods. On this hilly spot, in tiny Allenspark, her pie house flourished for twenty summer seasons. It was just a stone’s throw across the street from a teeny house, where she lived into her 90’s. Several changes of ownership and some 30 years later, Lil’s place was renamed Meadow Mountain Café. 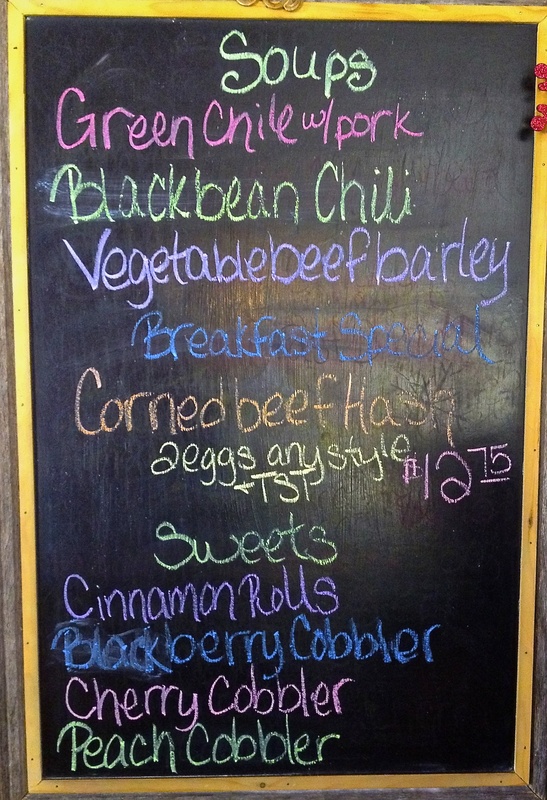 The menu became daily breakfast and lunch fare. Food was fresh and home-cooked to order, the coffee hot, with a hint of cinnamon. Consistently delicious food, friendly servers and reasonable pricing enhanced its reputation within the small community and radiated beyond. 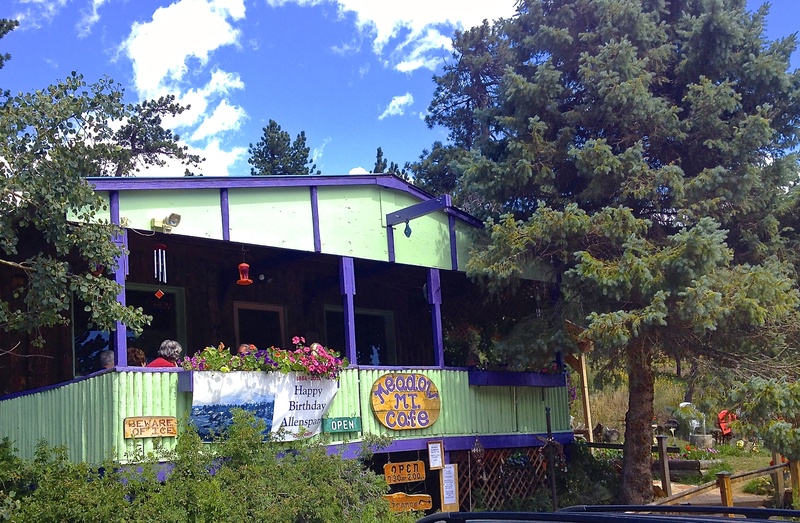 Locals and tourists began lining up for a table inside, or on the covered porch with hummingbird feeders, flowers and an overhanging pine tree. Lil’s seasonal pie house evolved into an Allenspark landmark with regularly returning customers, who eventually became friends. 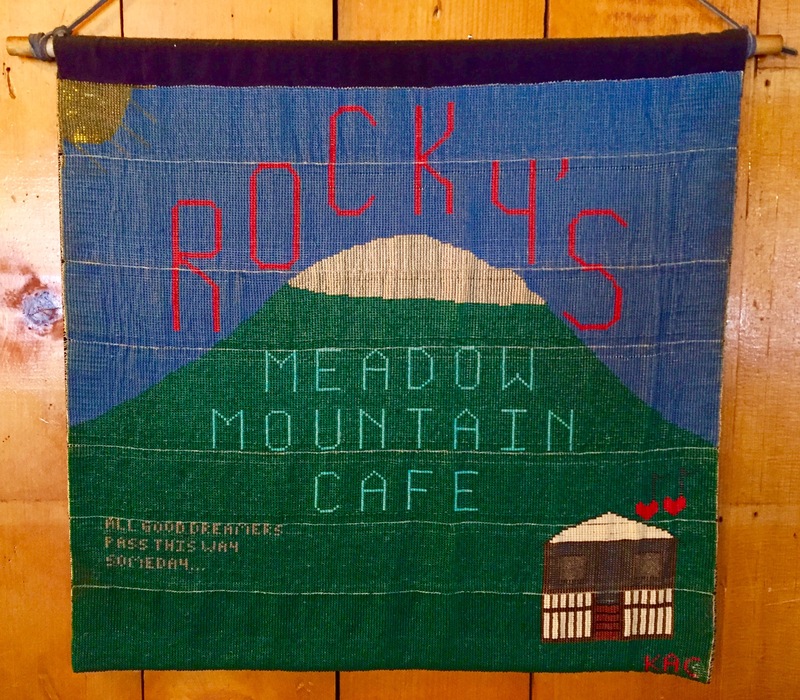 Roxanne [Rocky] St. John began waiting tables at Meadow Mountain in the late 1970s. Almost right away she was moved into the kitchen and continued to work the grill after two other women purchased it in the 1980s. Rocky finally took over solo ownership in 2007. It was time to put her personal stamp on the place. 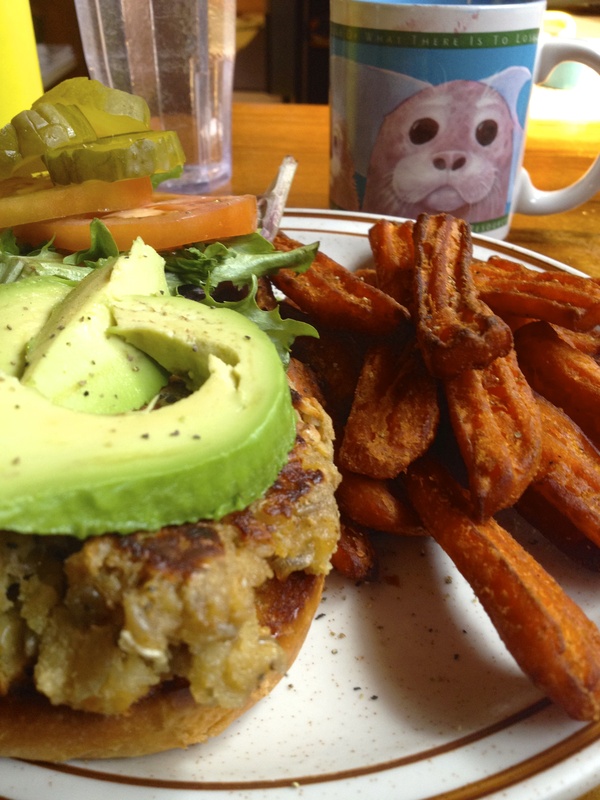 Rocky is responsible for introducing the veggie burger and the incredible green chili sauce for huevos rancheros. Both became specialties of the house. Cinnamon spiked coffee remains standard, of course. She chose the current paint colors, including easy-on-the-eye peach walls in the kitchen and built the button inlaid steps for safer access in all weather conditions. The funky array of coffee mugs and salt-and-pepper shakers were always part of her style. The music that blasts from the kitchen is pure country western or rock-n-roll oldies. Son Joe mans the grill, daughter Alicia works the front, and husband, Danny, does whatever needs doing. It’s a full family operation, year round, with added help in summer. On Tuesdays, they take one day of rest. 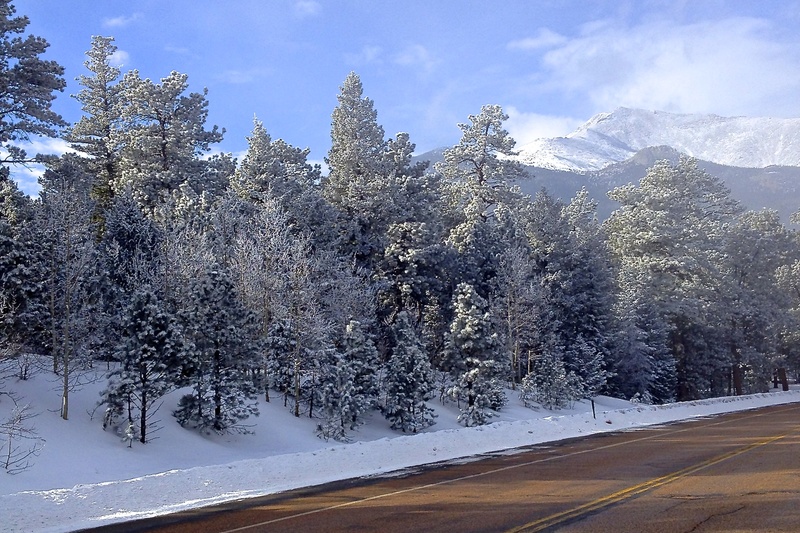 We have been driving from our cabin in Estes Park to Meadow Mountain Cafe for more than 15 years. I go by myself, with family, or with friends, usually for breakfast, sometimes lunch. It never disappoints. It’s not meant to be fast food. You wait patiently and sip good coffee, talk leisurely. Perhaps you warm your back sitting at the counter by the antique stove, muse over the salt-and-pepper collection, read a book, or eavesdrop quietly on another conversation. You watch regulars walk into the kitchen looking for Rocky and to say hello. A table of friends play cards in the corner after their meal. At the other counter, a man leans his chin into one hand, and dozes, holding his coffee cup with the other. Orders parade out of the kitchen. Coffee mugs are refilled. Homemade brown bread is sliced thickly for toast or sandwiches. Summer requires twice-a-day baking to keep up with demand. The scene is homey and multi-dimensional–from the diversity of people stepping through the front door to the din of kitchen music, mingled conversations and laughter, and the clatter of clearing plates as another table empties and fills. It always feels just right. 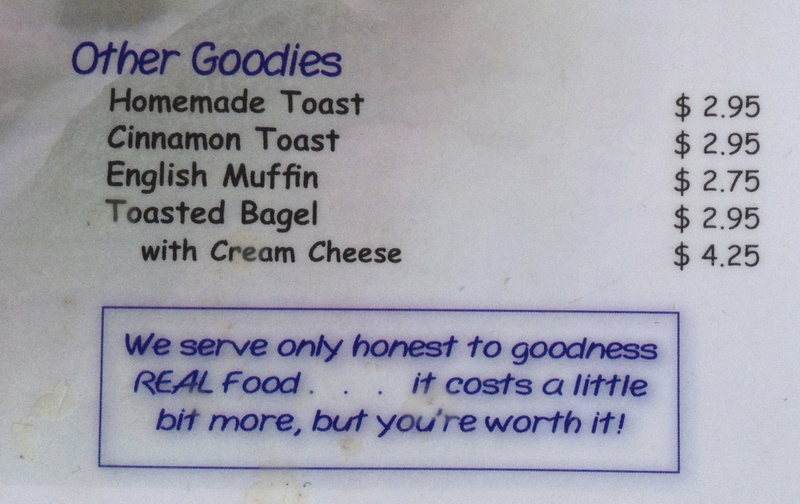 You are glad to be hungry and in Allenspark. What sustains 70 years of successful continuity in a community of just over 500 people? Rocky, and the female owners before her, perfected a simple yet timeless formula. Starting with an old-fashioned hard work ethic, they stay passionate about what they do and consistently do it very well. Quality is always high, service friendly, and customer relationships strong. And then, just maybe, a little hint of cinnamon in the coffee doesn’t hurt either. I hope you have your own gem of a hometown café–a place with honest food, ambience, and feeling of community–where you seek to be nurtured over and over again. 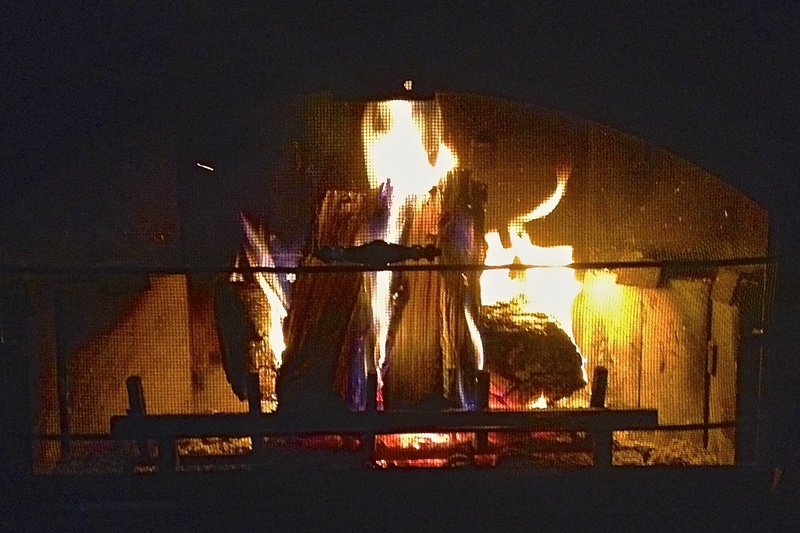 In Colorado, the holiday season was snow-white and the fireplace blazed night and day. 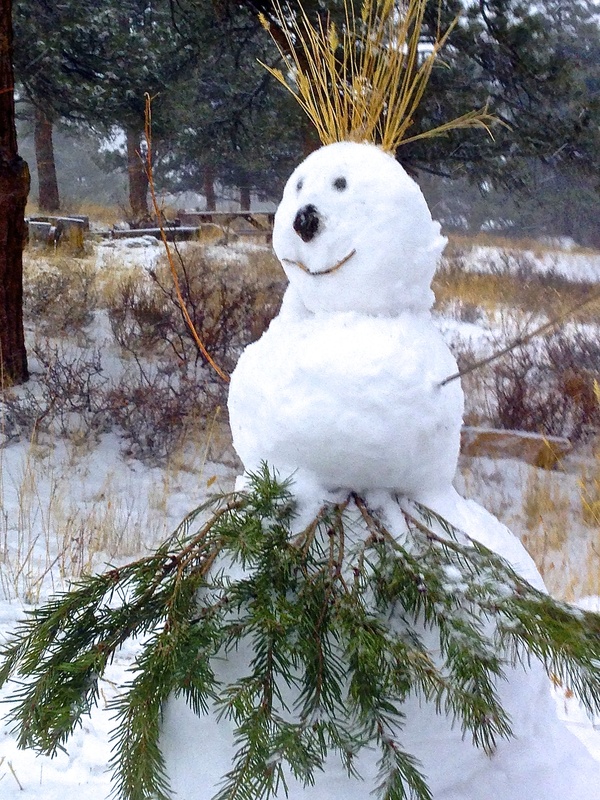 There were deer and elk on the hillside, daily hikes into the National Park, a miniature snow-woman laboriously constructed from barely packable “dry” snow, and, of course, there were egg sandwiches. 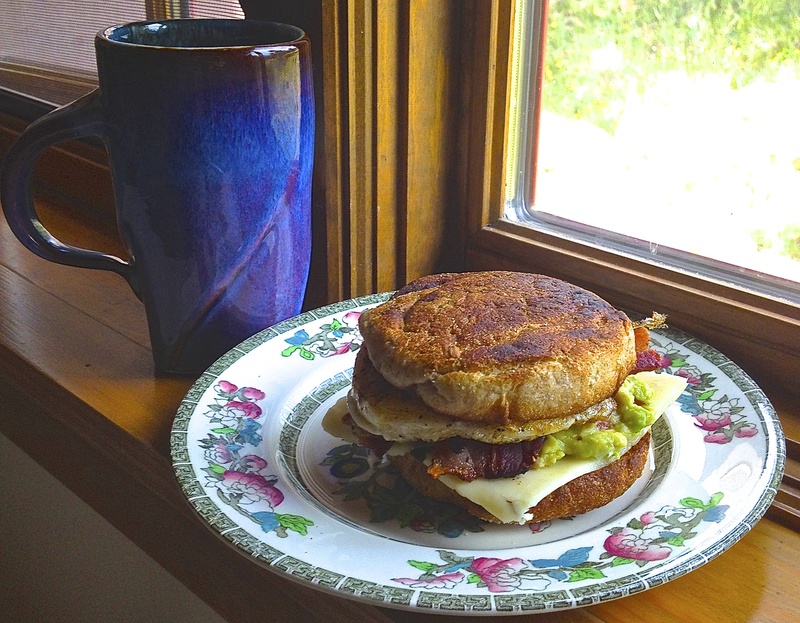 A multi-layered, made-to-order egg sandwich is staple breakfast fare when we are at home in the mountains. It is nourishment spiced with location, now entwined in longstanding tradition. The ritual evolved, as things often do, from something I read. Some 20 years ago, I was immersed in the writings of MFK [Mary Frances Kennedy] Fisher. In sensually descriptive prose, she weaves autobiographical stories of people, place and food. 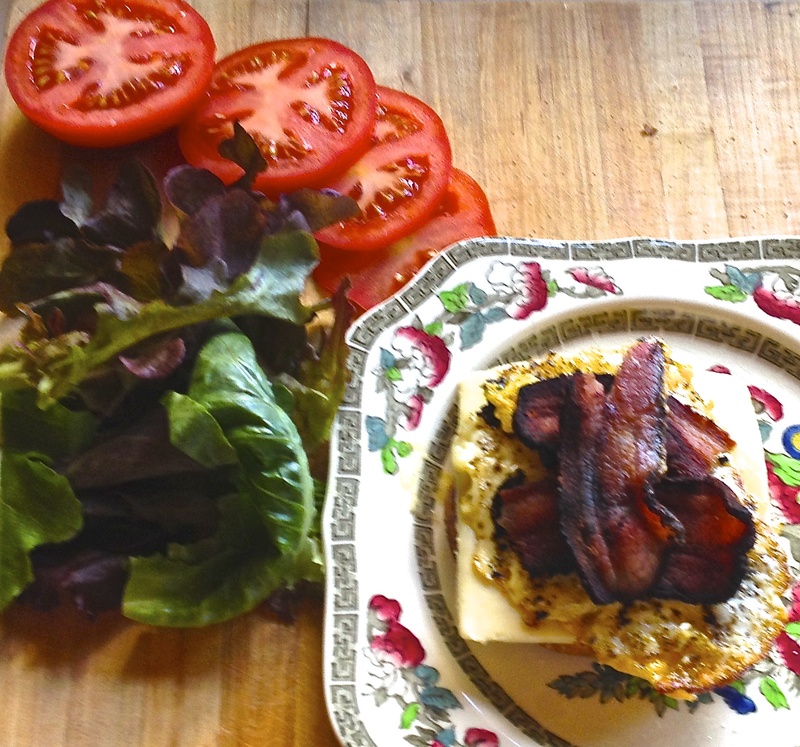 Her mythologizing of Aunt Gwen’s fried egg sandwiches particularly captured my imagination. It is the tale of a child’s realization that food and life’s lessons are often inseparable from a strong, loving mentor. 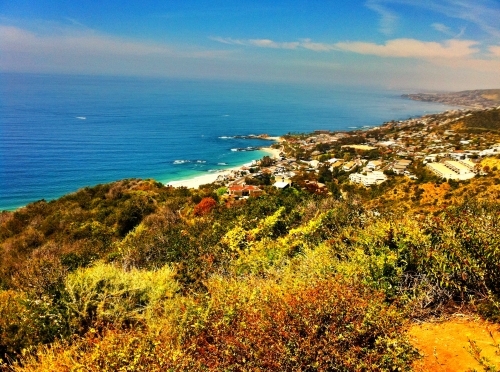 With Aunt Gwen leading the way, Mary Frances and her younger sister hiked the hills and cliffs above the beach, singing hymns and marching songs at the top of their lungs. And always, there was an egg sandwich, or two, carefully tucked into their pockets. I love this description because it encompasses much more than satisfying simple physical hunger. Fisher was learning, at a young age, that the right combination of food, company, and spiritual nourishment were a metaphor for living well. 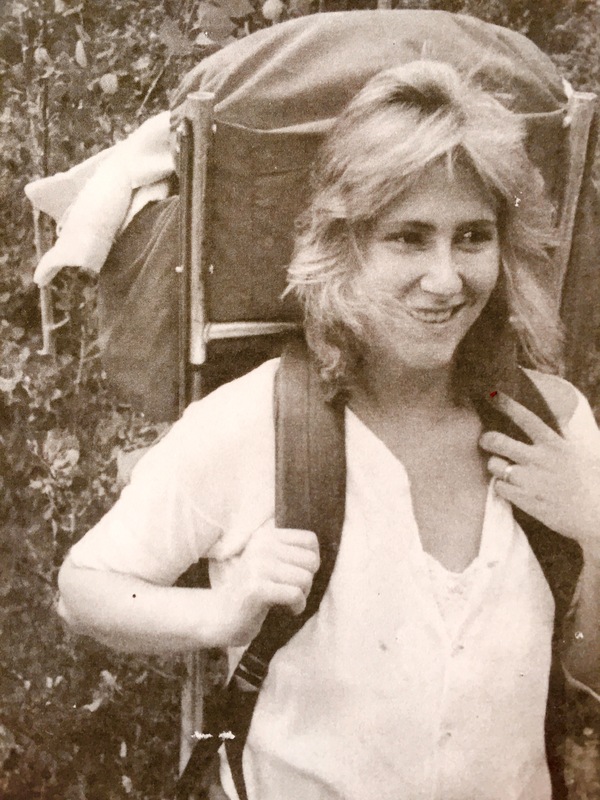 The spiritual ingredients of those egg sandwiches included “equal parts of hunger and happiness”, a hillside sunset, and companions she loved. There are no cliffs overlooking the ocean where our cabin is located, but cool summer mornings and darkly cold winter ones stimulate good appetites. 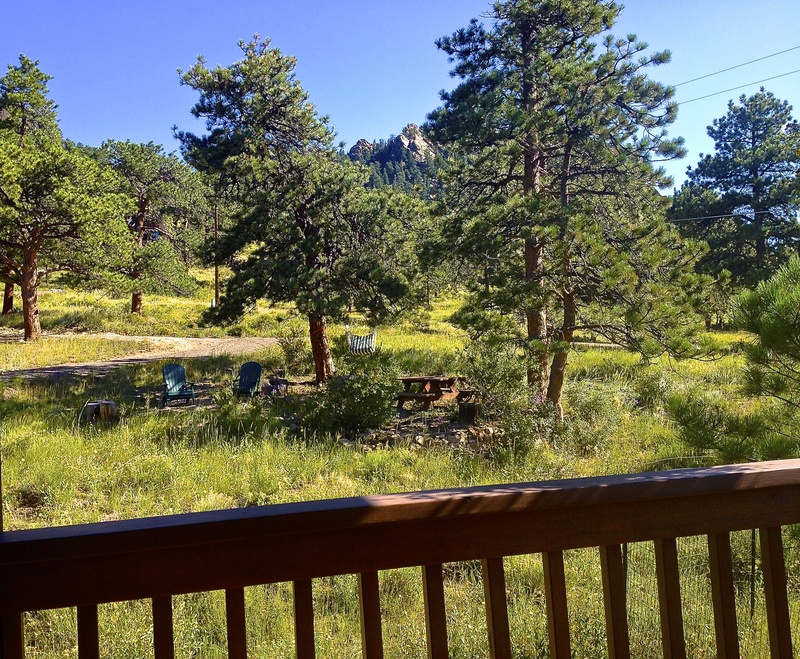 Mountain views, towering ponderosa pines and native wildlife provide our spiritual geography. 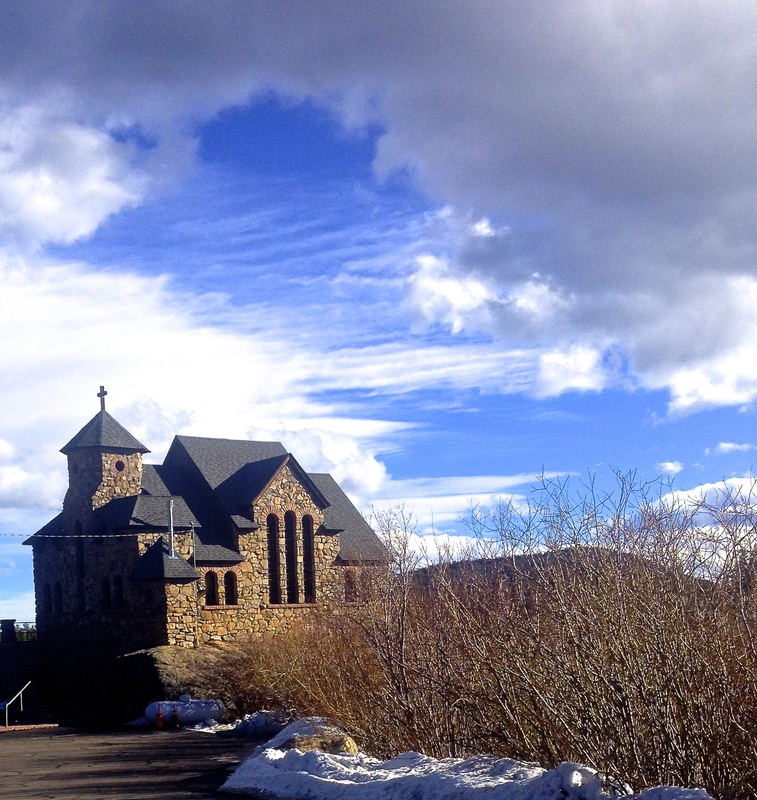 When we are in residence in Colorado, family and friends are often with us. 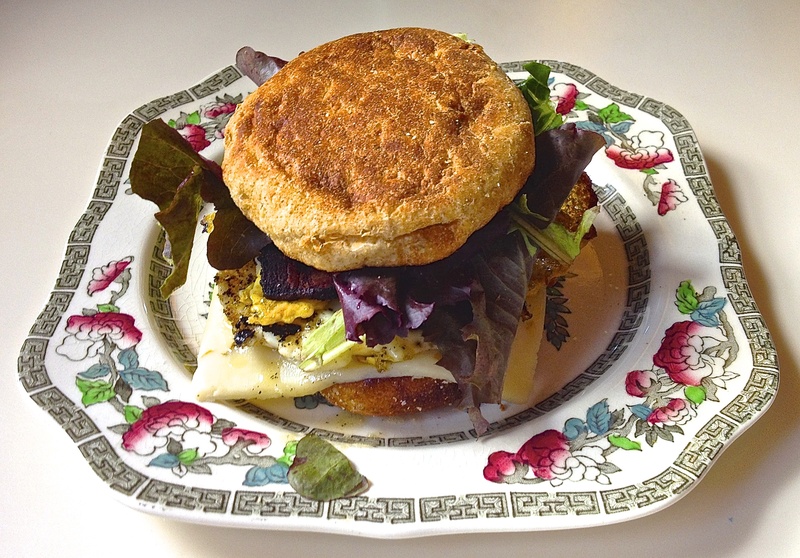 With Fisher’s story in mind, a tradition was born around the kitchen table in winter and the front porch in summer—our mountain version of the fried egg sandwich. Aunt Gwen’s original recipe was well documented. It started with heating the grease from whatever was cooked the day before in a large flat-bottomed skillet. When the fragrant drippings reached a smoking hot temperature, an egg was dropped in, the yolk broken, and quickly fried so that the edges were crisply brown and barely digestible. Next, two slices of good bread were added to the pan and browned on one side only. 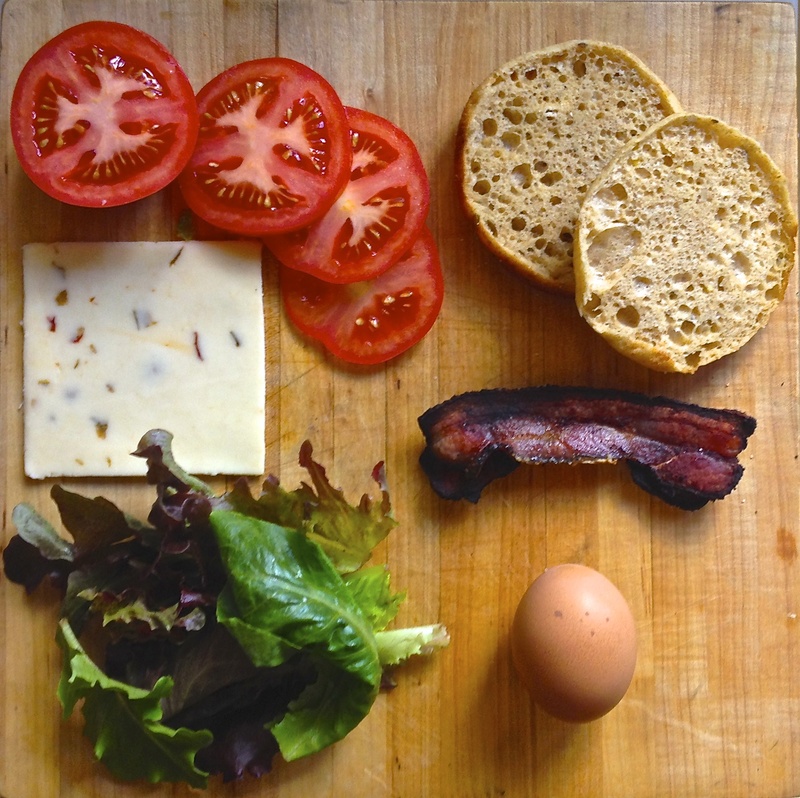 The cooked egg was slapped into the middle of the bread slices and pressed together. Finally, the whole thing was wrapped in wax paper that partially melted into the sandwich, small pieces of which were consumed when bit into with hunger and a happy heart. 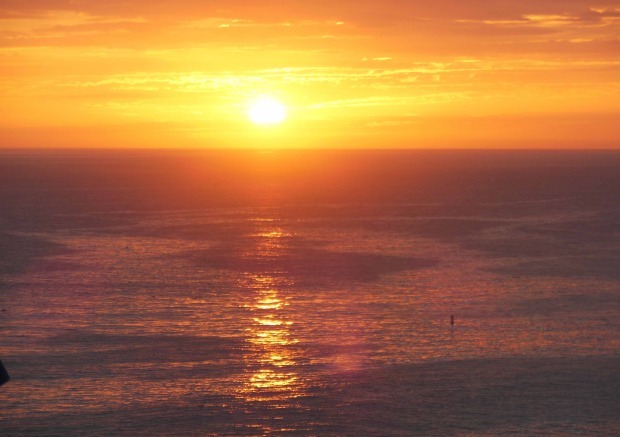 An ocean hillside sunset and good companionship completed satisfaction of body and soul. As an aid to digestion and modern taste preferences, this is our contemporary version. Assemble ingredients. Cook bacon in a well-seasoned cast iron skillet. 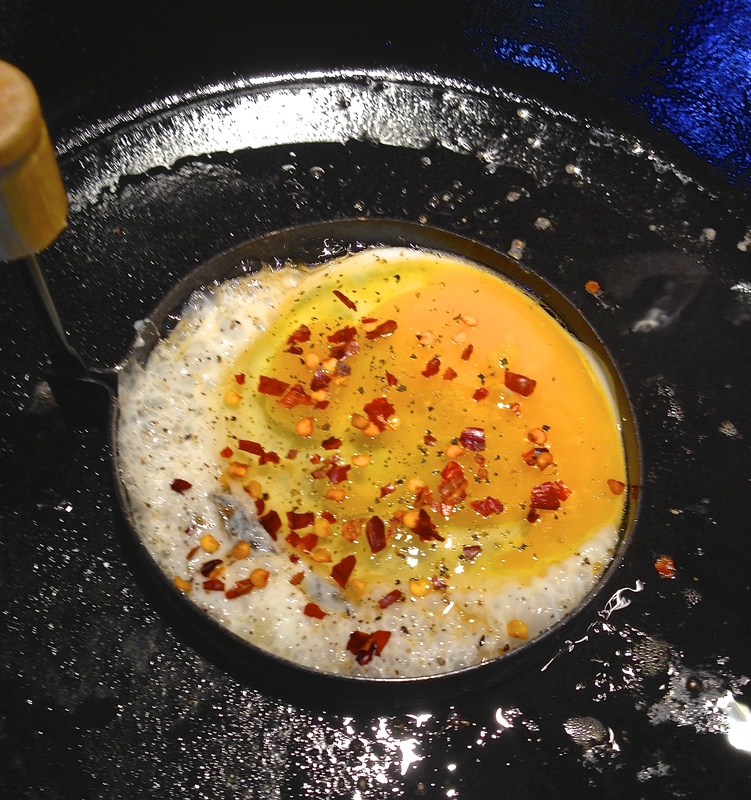 Using the bacon drippings, crack an egg into round metal form and break the yolk. Season if desired with S&P or red pepper flakes. 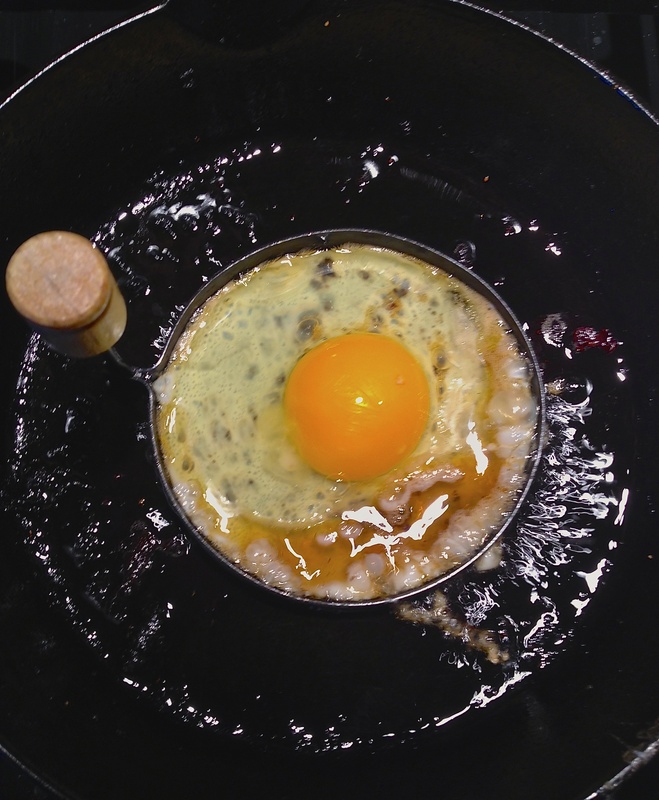 When egg is set, remove the form and gently turn the egg over for just a few seconds. 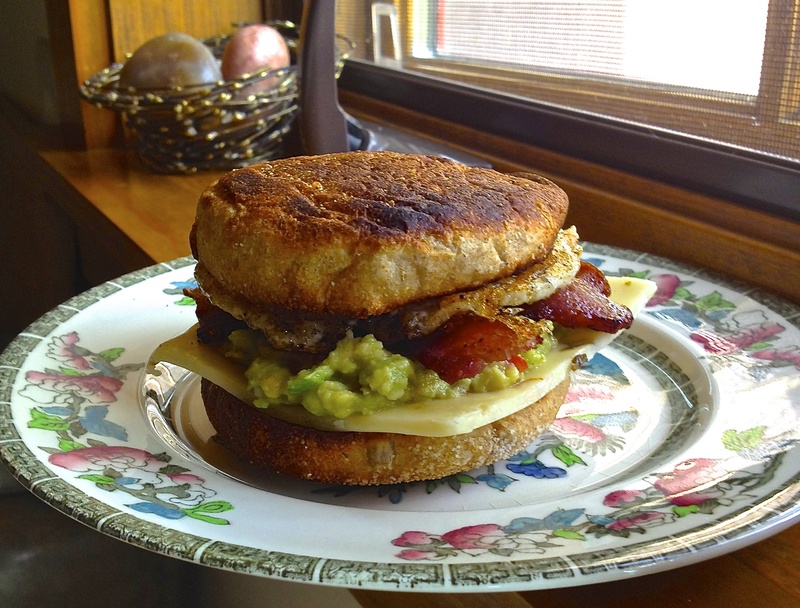 On toasted English muffin, layer a thin slice of cheese, tomato, bacon and optional ingredients [avocado, salsa, etc.]. Add cooked egg and fresh spinach leaves or other greens. Press the whole thing down to a manageable biting size. Eat immediately while hot, using both hands. A mug of strong coffee or tea makes a desirable accompaniment. 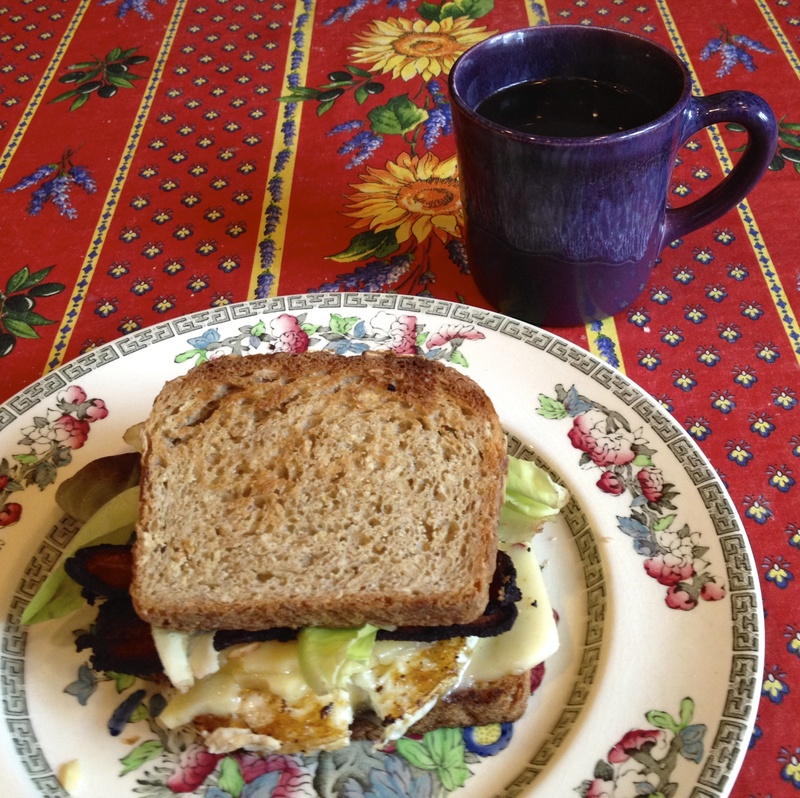 Traditions are specific to individuals or families, but the ritual and meaning behind Aunt Gwen’s egg sandwiches is as important to me today as it was to a young girl a century ago. It is fortunate, indeed, at whatever age we learn this to be true.